Is This The New Samsung Galaxy S4? It’s just a rendering, but the Twitter account behind @evleaks are on the hunt again. 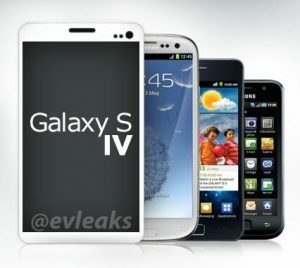 This time it’s the new Samsung Galaxy S4. The render also includes some specs, as well as a comparison to older models. 16GB, 32GB or 64GB of storage (no SD card). 2GB RAM. This is just a render, but it is much more squared off than it’s predecessor. Other than that it’s still recognizable as a Galaxy phone, which is what Samsung was going for. Note that it is also running the latest version of Android. One note of concern is the lack of expandable storage. The three flavors of on-board storage (16/32/64GB) is Apple-like to say the least, but that seems to be the trend this year. The Galaxy S4 is one of the most looked forward phones of the year, but how will it stand up to the HTC One? If history is any guide, Samsung will continue to dominate. So what do you think, real or not?